The pattern (in both formats) will be on sale for $7.50 until October 4th. 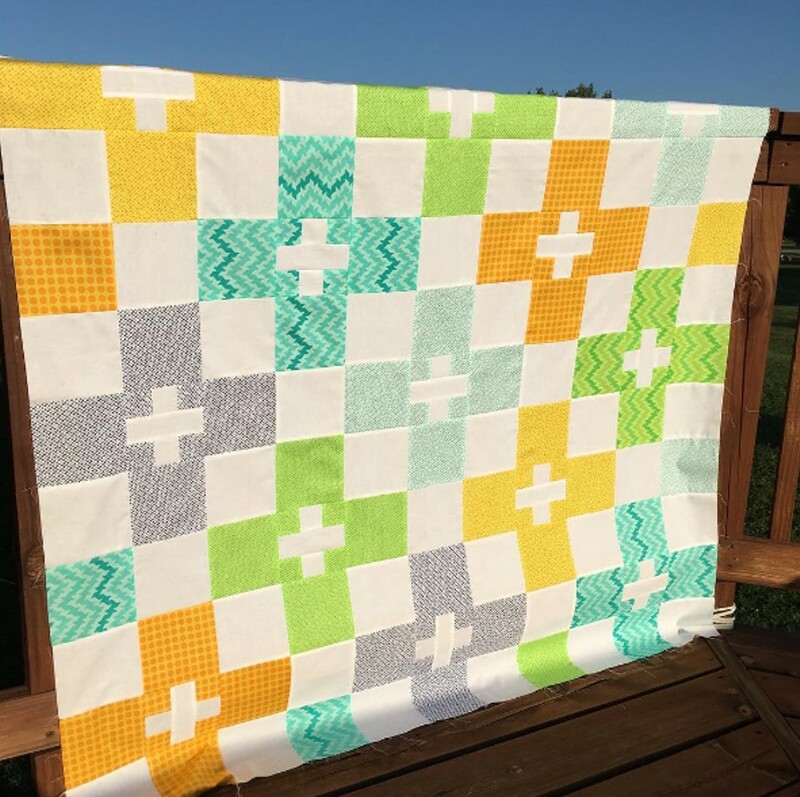 The lap size version of Check Plus was originally published in the November/December 2014 issue of Quilty Magazine and used the April Showers fabric collection by Bonnie and Camille for Moda. I have received numerous requests for alternative sizes over the past couple of years so I am happy to be able to release the pattern with 4 sizes. Check Plus is beginner-level, fat quarter friendly and is now expanded to include baby, lap, twin, and king sizes. I want to thank all of my pattern testers and reviewers, their suggestions and edits have greatly improved the pattern! Some of my reviewers are offering giveaways of Check Plus (and Vintage Star which will be posted about tomorrow). Click the links marked as giveaway for a chance to win! Just as a reminder: The pattern is now available on Etsy and Craftsy for $7.50 until October 4th. What a great pattern. Congratulations. I love the white background check pluses. It looks to be a great beginner pattern. Thanks for sharing. Congrats on the pattern release. Plus in a plus, two the price of one. The testers did a great job with this fun pattern. Congratulations on a wonderful finish! Congrats! It's no small feat releasing a pattern! Congratulations on a great pattern- I love it! I have that issue of Quilty, and your pattern has a post-it note on it! 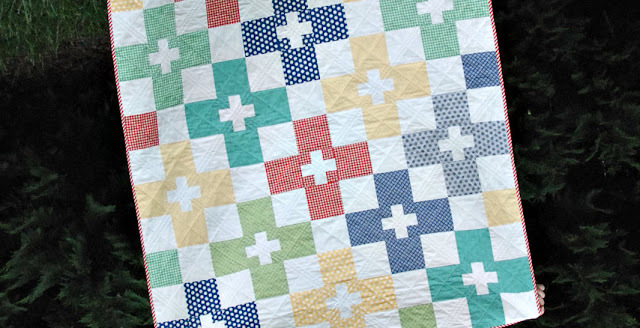 It would be wonderful to have all the sizes of this fun, graphic quilt! Beautiful quilt and great pattern. I'll check out your patterns for my next quilt. This really appeals to me! 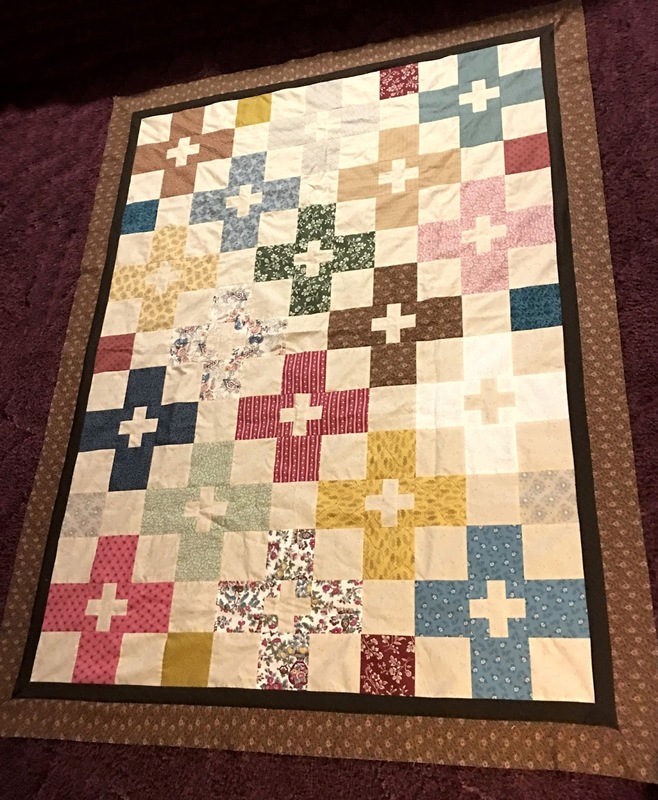 Adds a little dimension to a plain plus quilt! Great job! Congratulations Cheryl! Check Plus is such a great pattern!!! I love your new Check Plus pattern!!! Just bought the pattern! My son-in-law has been asking for a "cross quilt" for two Christmases .. I think this will fit the bill for him. Thanks! Love the double cross pattern, Cheryl! Congrats on the pattern release! Congrats on releasing your new pattern!! Check Plus is a winner. I wish you many sales of this clever pattern. Congratulations on another great pattern! Your patterns are so wonderfully written Cheryl. Congratulations on what looks to be another great one! Love this!! Congratulations for publishing yet another fantastic pattern! Congrats on another fun and pretty pattern. Very pretty pattern-love the pastels - the best! Cool pattern. Always fun to see different versions. Well done! I like it, one to make for grandson at university for next year, his second year and maybe a flat or a self catering place. This would be great, and in his favourite blues, a winner. Another fab pattern, Cheryl, you are a whizz at these, and with other very generous give-away at the other quilters, I am in awe. So pretty; and I have scraps to make it totally scrappy! Great quilt! Congrats on the pattern launch! Very pretty. I would love to make this plus quilt. 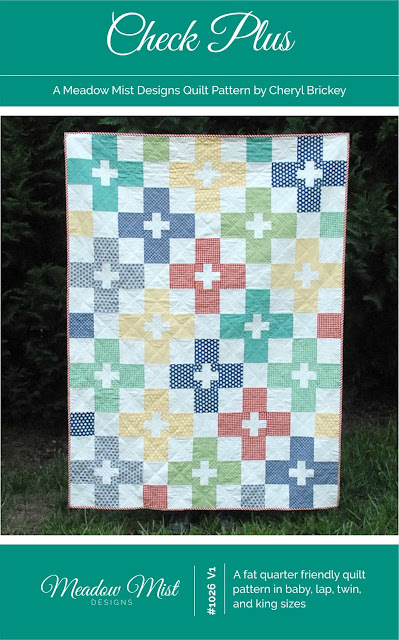 Geez Louise, just when I think nope, can't be any more takes on the popular Plus quilt, you come up with another! I still haven't made your Outlined Plus which I bought when you launched that one, and now I do really like this one!